According to Davis-Standard, healthcare foodservice supplier Aladdin Temp-Rite has improved processing rates by 30% after installing its 4 ½” (114mm) vented Thermatic extruder in September 2011. Aladdin is using the extruder to process impact polypropylene sheet with filler at 12 to 27 mils in thickness. This sheet is used in all types of foodservice products including cups, bowls, lids and food trays. In addition to the extruder, Aladdin purchased a touchscreen Allen Bradley PLC controller from Davis-Standard. The new PLC was also integrated to work with the existing system. 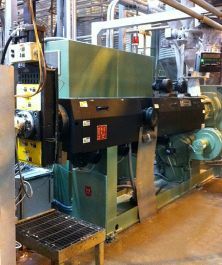 The extrusion machinery supplier says downtime caused by installation was minimal and Aladdin’s production efficiencies have improved significantly since the upgrade.